Vigorous M&A activity in 2015 and 2016 has reshaped the landscape of the semiconductor industry, with the top companies now controlling a much greater percentage of marketshare. 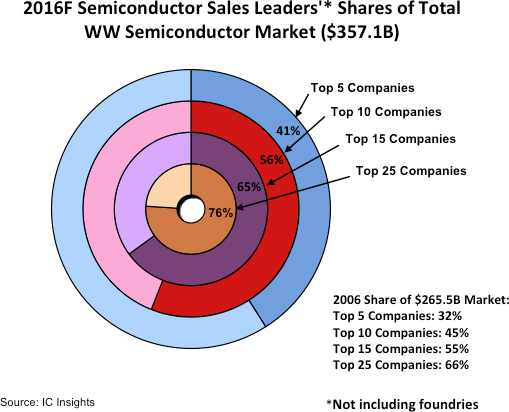 Not including foundries, IC Insights forecasts to top five semiconductor suppliers—Intel, Samsung, Qualcomm, Broadcom, and SK Hynix— will account for 41% marketshare in 2016 (Figure 1). This represents a nine-point increase from the 32% marketshare held by the top five suppliers ten years ago. Furthermore, the top 10 semiconductor suppliers are forecast to account for 56% marketshare in 2016, an 11-point swing from 45% in 2006, and the top 25 companies are forecast to account for more than three-quarters of all semiconductor sales this year. Following an historic surge in semiconductor merger and acquisition agreements in 2015, the torrid pace of transactions eased a bit in the first half of 2016. However, 2016 is now forecast to be the second-largest year ever for chip industry M&A announcements, thanks to three major deals struck in 3Q16 that have a combined total value of $51.0 billion. These deals were SoftBank’s purchase of ARM, Analog Devices’ intended purchase of Linear Technology, and Renesas’ potential acquisition of Intersil. With the surge in mergers and acquisitions expected to continue over the next few years, IC Insights believes that the consolidation will raise the shares of the top suppliers to even loftier levels.